Habitat: This species prefers quiet, still waters. Distribution: Widely distributed fish, from the Zambezi system to Kwazulu Natal and northwards. Found in most areas of South Africa. 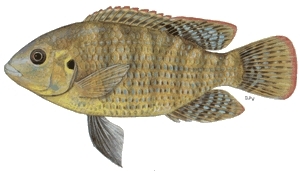 Description: As the name suggests, the banded tilapia has dark green bands down it's body. Fishing Strategy: Very small fish, care must be taken when handling this fish. Even though the fish is very small, on light tackle a fight can be fun and exciting. Eating Quality: Not eaten, due to the fish’s very small size.